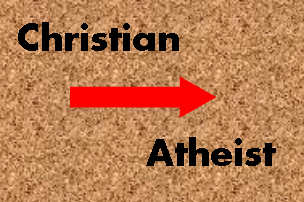 What Causes a Christian to Become an Atheist? I’m pausing briefly in my series on learning more about General Revelation through Finding the Fingerprints of God to share a very insightful post by Natasha Crain (Christian Mom Thoughts). The post is helpful in identifying some of the reasons that Christian kids leave their faith. The reason I’ve been giving background information on the existence and fine-tuning of the universe and how our galaxy and solar system are designed for life is to provide you with evidence for the existence of God outside the Bible. Your kids are going to need to understand this material, and more, as today’s post will illustrate. When you read the atheist’s comments in this post, please keep in mind that the struggles this individual had with doubting God’s existence could one day become the struggles that your own child has. Regardless of whether or not your child struggles with these issues right now. Regardless of whether or not you ever struggled with these issues. The Finding the Fingerprints of God series that I’m in the middle of posting about is one of the lines of evidence that would help a child to know that there is evidence for the existence of God outside the Bible. One of the biggest reasons this Christian turned atheist had for turning away from God is that he seemed unprepared to differentiate or understand how the Christian God compared (or ‘competed’) with other concepts of God (the Christian God vs. Buddah, for example). He didn’t know that there were good reasons for his faith outside the Bible (such as those I am introducing you to in the Finding the Fingerprints of God series, among others), nor good answers to his challenges about the reliability of the Bible, nor did he seem to have a solid foundation in theology (most Christians in North America do not). Please consider seriously the potential implications of not building these into your child’s faith from their earliest years. You do not need to wait until these become issues for your child (I’d suggest that you shouldn’t wait that long!). Begin now to prevent them from becoming issues later on. There are many resources on this blog site and others to help you in that regard. Natasha’s commenter begins by saying that the number one reason for rejecting God (and Christianity) is doubting the existence of God, especially the existence of the Biblical God. The commentator’s thoughts are in black, Natasha’s advice to her readers are in red. Posts like this encourage us to do everything we can to invest in our kids and to keep our eyes open for what society will throw at them. I hope it encourages you to do the same! I’d love to hear from you – leave a comment or send me an email. ← Fingerprint #3: Earth is Designed For Life! Thanks for sharing the post! This is key from what you said: “You do not need to wait until these become issues for your child” – exactly. So many people think they’ll figure things out when their kids ask the questions. If you wait until they ask the question, they’ve probably already been thinking about it for a while. And many kids will NEVER ask what is on their mind. We’ve got to be the ones to push them to critical thinking. I love your posts! At some point, I’m going to do a post that summarizes your fingerprint activities and links to those posts. They’re great!